With the strongest online reviews and most reputable resource for Certified Public Accountants and IRS Enrolled Agents, CPEthink understands what you need from your accounting CPE courses and exactly how you want them delivered. With instant customer service, we take an all-hands-on-deck approach to further your education without having to spend hours in a classroom. Enhance your skills and maintaining your licensing requirements with our hundreds of industry-leading, self-paced online CPE courses. We offer the most competitive prices with impeccable value. All your resources and tools will be available online in one place. Offering accounting CPE courses online that cover all of your licensing requirements, you’ll maintain the flexibility to join courses regardless of where you are in your licensing journey. Start, continue, and complete your CPA requirements with our industry-leading accounting CPE courses, today! In order to maintain your enrolled agent status, the IRS requires accounting CPE courses to be completed in a cycle. The beginning stages of enrollment include two hours of CPEthink continuing education credits per month in addition to two hours of professional conduct or ethics per year. Upon enrollment as a regular member of the American Institute of Certified Public Accountants, 120 hours of continuing professional education during each three-year reporting period, is required. In three years, you would need to take the correct amount of continuing education courses to reach 120 CPE credits in order to maintain your membership. CPE requirements vary from state to state, but our goal here at CPEthink.com is for these requirements to ensure that practicing CPAs remain up-to-date with the latest expansion in the field of accounting. 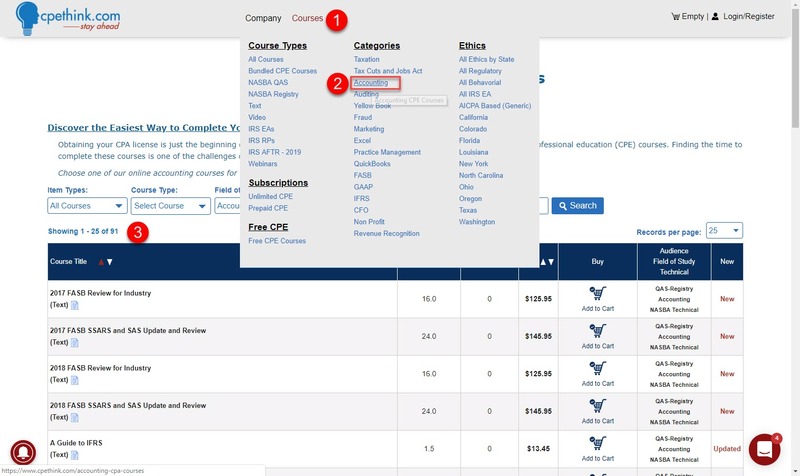 CPEthink.com provides the Continuing Professional Education that the CPA and IRS Enrolled Agent needs to satisfy their required continuing education credits with their state board of accountancy or licensing agency or with the Internal Revenue Service. Explore the finance and accounting courses that you need to fulfill your requirements with the all-inclusive online accounting CPE courses for CPA’s CPEthink.com has provided all the tools and resources you need to stay ahead. Purchase the exact individual course you need for your current enrollment cycle. Download your online CPE course onto any device. Get instant online grading and feedback. Go at your own pace to complete courses within 1 year. Print your certificate immediately upon passing your exam, or access your certificate anytime from your CPEthink.com account. Combining decades of field expertise and modern technology, our qualified self-study CPE courses will prove to be the only online resource you’ll need in your CPA career without the boring graphs and cold classrooms. Our CPA continuing professional education self-study courses are all developed by leading professionals in the industry. This is to ensure that our students get high-end CPA continuing education that will give them the CPE credit opportunities that they need for acceptance in all jurisdictions that utilize the National Registry Program.s (NASBA) guidelines for continuing education CPA credit requirements. Our CPA continuing education online courses are run from state of the art servers, and we also have top of the line mirrored servers that will ensure no disruptions for your online CPA classes. Live chat is always available so that you can learn more about the career-altering courses we can provide and answer any questions you may have. Join the thousands of online accounting CPE course graduates to enhance your skills and maintain your requirements at a pace the suits you best. Our high-quality, industry-leading course standards are designed to remain an integrated part of your career growth. Is CPEthink Right For You? ... then this is the place for you. We are here to empower and educate CPA professionals just like you. Join us! Want the Best Accounting CPE Courses anywhere on the Internet? You have found them right here and to prove it see what our current and past customer say about us online. Go to https://www.cpethink.com/cpe-reviews and see why we are the most prefered and have the most return visits of any CPE provider. Reviews are given by customers only after they have made a purchase and completed one of our courses.